there's a not altogether uncommon saying around these here parts that you can tell when it's summer because the rain gets warmer. the only time that is less than true is whenever i've been sent a waterproof jacket to review. at that point, the clouds scurry hither and thither, the farmers moan that the ground needs rain and you could fry a free-range egg on the pavement. actually i might be fibbing about that last bit. 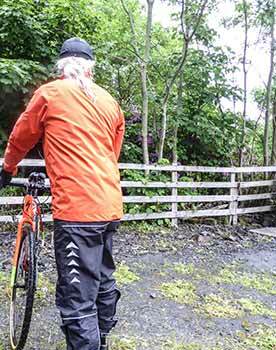 this is a rather round about way of saying that my review of hilltrek's single ventile lightweight greenspot jacket will probably not be resolved at a single sitting. as i recall, pretty much the same thing happened when attempting to review its double-ventile big brother. ventile is a pretty darned interesting fabric, fashioned as it is solely from tightly woven cotton, bereft of any form of durable waterproof coating. therefore, unlike many of its allegedly more technologically advanced peer group, there's nothing to wash off after several months or years of use. actually, and rather oddly, despite its natural origins, hilltrek recommend that both single and double ventile variations are dry-clean only. since the lightweight review garment was as burnt orange as its predecessor, there's more likelihood of it needing to avail itself of the cleaning process than the olive, charcoal or black editions. that, however, is a risk i'm more than happy to accept. hilltrek advertise this lightweight variation on their website as "Ideal for warm weather cycle touring and commuting." the lightweight aspect is more than accurate; there is a noticeable difference in heft between this single-ventile example and the double-ventile edition. however, i cannot but make a couple of polite suggestions as to how the jacket might be made a tad more cycle friendly. firstly, there are only two, large, zipped front pockets. impressively, either of these capably swallowed a marginally oversized mini-pump without any discomfort while pedalling. but having to place everything in those pockets is not what might be referred to as a good look. either a lower internal pocket or preferably one reasonably sized rear pocket would have been ideal. hilltrek's double-ventile jacket features two, zipped rear pockets, which have proved invaluable in oh, so many ways, by keeping any accoutrements away from frantic pedalling action. on the plus side, fewer pockets really ought to translate into carrying only essential bits and bobs, but cyclists are only human after all. my second suggestion is a tad more superficial, but would be a neat luxury nonetheless. 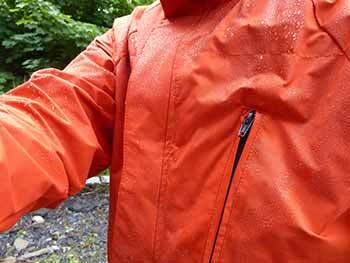 the high collar on the lightweight jacket is quite excellent, particularly with a popper to fasten against the elements. however, an internal drawcord would be a helpful extra to pull it a bit closer when riding on the lower portion of drop handlebars. i know i'm guilty of nitpicking here, but a cyclist can dream can't he? 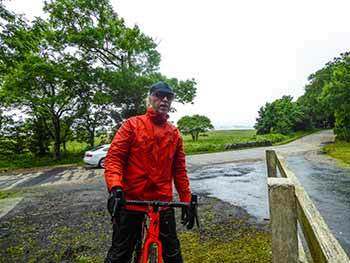 i apologise to hilltrek if i appear to be painting a rather negative picture of what is truthfully an excellent jacket, one that's every bit at home in the saddle as it is forcing its way down bowmore main street into wind-driven rain. 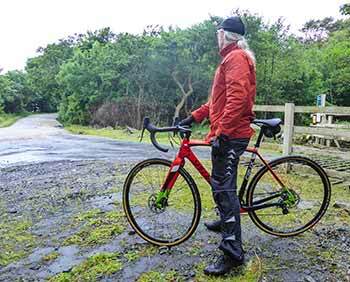 though i have yet to find a breathable jacket that copes with the heat generated by an intrepid cyclist, the greenspot lightweight fares considerably better than most. add to that the fact that its lightweight, hard-wearing nature offers versatile comfort on and off the bike at this time of year and it begins to look like a more than appropriate choice of garmentage for both touring and/or cycle commuting. the full-length sturdy front zip features a wide storm-flap, poppered at both top and bottom, while the single weight ventile fabric means the jacket is more than flexible enough for the occasional bout of enthusiastic pedalling. but, of course, its build and sartorial elegance are as mere bagatelle if it fails in its primary purpose; keeping me dry. so far i've managed only around eight kilometres in heavy drizzle, during which a coating of baubled raindrops offered the very comfort that i sought. as with the double-ventile edition, i'd have liked an extra couple of centimetres on the sleeves, but given that this is an option when ordering, i can but congratulate hilltrek on realising that cycling activity often demands subtle differences from that of walking or hiking. part two of this review will have to wait until that warm summer rain reaches saturation point, when i can guarantee the prospect of getting a thorough soaking. till then, i am verily sitting pretty in burnt orange. hilltrek's greenspot lightweight single-ventile jacket is available in black, olive, royal blue, charcoal or burnt orange, in sizes ranging from xs to xl at a cost of £220. the jacket can be ordered in optional non-standard length and optional non-standard sleeve length at extra cost.